Iranian director Kamran Heidari is one of the most accomplished documentarians currently working, but Americans have had few opportunities to see his work. 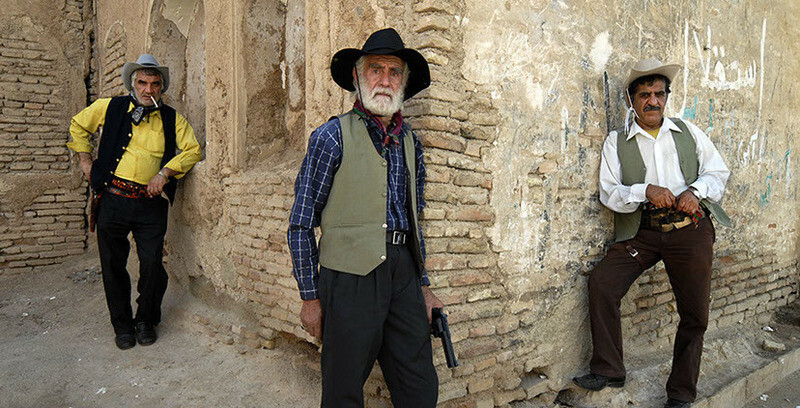 His 2012 film "I Am Negahdar Jamali And I Make Westerns" is his only movie to get much exposure outside Iran, and although made two years ago, "Ali Aqa" [pictured at top] only received its U.S. premiere in February (it will be released theatrically and on-demand at the end of the summer). But New Yorkers will have a chance to see his four most recent films, including the world premiere of his brand-new "None of Your Business," in a series I programmed at Brooklyn's Spectacle Theater that starts April 2nd and runs for the entire month. Heidari's "I Am Negahdar Jamali And I Make Westerns" celebrates an amateur filmmaker who devotes all his spare time and money to the Westerns he directs in the desert outside Shiraz and shows to the same community from which he finds his cast and crew. 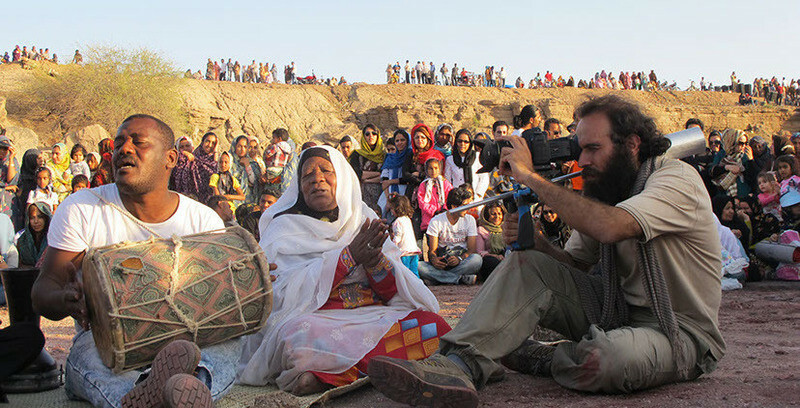 "Dingomaro" profiles Hamid Said, an Afro-Iranian musician, as he plans a concert. 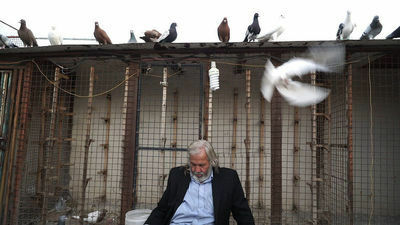 "Ali Aqa" focuses on a cranky old man who distracts himself from his worsening health by keeping pigeons in a coop on the roof of his apartment building. "None of Your Business" introduces elements of fiction to tell the life of the musician Ebrahim Monsefi, who died of a drug overdose in 1997, with a drone-mounted camera representing his point of view. Heidari’s work shows a deep sympathy for artists and other people who have been left behind by society. That may be one reason the filmmaker (who lives in the southern city of Shiraz, rather than Tehran), hasn’t been embraced by the Iranian film industry and its annual Fajr festival. I interviewed Heidari via e-mail, with translation by Mehdi Omidvari. For more information, check out @maaafilm. How did you get started as a filmmaker? Did your introduction to filmmaking start around the time you began working in photography? The cities in the south of Iran that have oil [received films] earlier than other parts of the country. Because of the foreign workers in the oil industry, they needed more entertainment in town. I was so young when cinema was very popular in our small town. The films were of course censored but it was still very attractive and I watched a lot of films in theaters. I saw a lot of classic movies and Westerns and that formed my interest in cinema. So, I learned cinema through watching films and I didn’t go to film school. At the same time I started working as a photographer because I thought that is a good basis for cinema, especially documentary photography. "I Am Negahdar Jamali And I Make Westerns"
When did you meet Negahdar Jamali? How much time did you spend with him before it became clear that he would be a suitable subject for a film? I met Negahdar at one of his own film screenings. He introduced himself as a filmmaker who makes Westerns and he was so serious about it. He gave me his films. I saw them and I was so surprised, so I decided to make a documentary about him and his films. I wanted to do more research because I wanted to make the film in a better financial situation and also to have more expertise. From the time I got to know him till I made the documentary it took two years. [During] these two years we watched his films, and went to his film sets with him and I got to know his family. Do you see much of yourself in Jamali? Not much about our approach to filmmaking. He likes to make dreams and creates heroes in his films, but I want to make films with real people, and their goals in their life. He just likes the visuals of cinema, but I am also invested in story. But we have some similarities in our techniques. We both love cinema so we love to make films through our hard work, but without any fear, very independent and with a low budget. I remember Abbas Kiarostami loved how Negahdar makes films and in one of his workshops in Japan, [Kiarostami] showed Negahdar's film to his students and told them, “Learn to make films without fear, just like Negahdar.” I also follow this rule. Every filmmaker has a favorite filmmaker, so my favorite filmmaker is Negahdar. Jamali’s family seems unhappy both about his own filmmaking and your documentary. Has his life changed since its completion? Of course, with his condition and his insane passion for filmmaking, his family is unhappy, mainly because he spends most of his time for making films and doesn’t care for his family. After finishing the documentary we had multiple public screenings with his presence, but they were not unhappy about it. The main reason was that I made it clear with them from the beginning that documentary filmmaking is about life and its difficulties. Sometimes it becomes very unpleasant, so they agreed that I would be present in their private life. Negahdar became very famous after this documentary and he was invited by Iranian TV multiple times. A lot of newspapers interviewed him. Some film magazines published some issues dedicated to him. A German documentary filmmaker made a TV documentary about him but for Negahdar who was unknown to people for years this was a big change and he made more films after all of these changes. He is still making films. "Dingomaro" shows little overt racism, but Hamid Said runs into some misunderstanding and hostility when trying to mount a concert celebrating black Iranian identity. How much does Iranian society acknowledge the existence and contributions of Iranians of African descent? This is the first time I have been asked this question outside Iran. As a documentary filmmaker I tried to show how Afro-Iranians are in a good relationship with the other Iranians through music. I have lived in the south of Iran for years and I haven’t noticed that much racism against people with African background. But obviously they have a different lifestyle than other people. In recent years, there has been more interest in their lifestyle, culture and music. For example, Gholam Zarei, who is one of the main characters in the documentary, is a very well-liked and well-known character in the cultural scene in the south of Iran. You worked as your own cameraperson on "Ali Aqa," which allowed for an intimacy with Ali and his family. However, you have also worked with slightly larger crews. Which do you prefer? I did cinematography on most of my films, except "Dingomaro." Except for "Ali Aqa," I always had a team. I believe in easy filmmaking, so I always have a small team, probably three people. I am planning to make features and narratives in the coming years, so I think I need a bigger team for them. 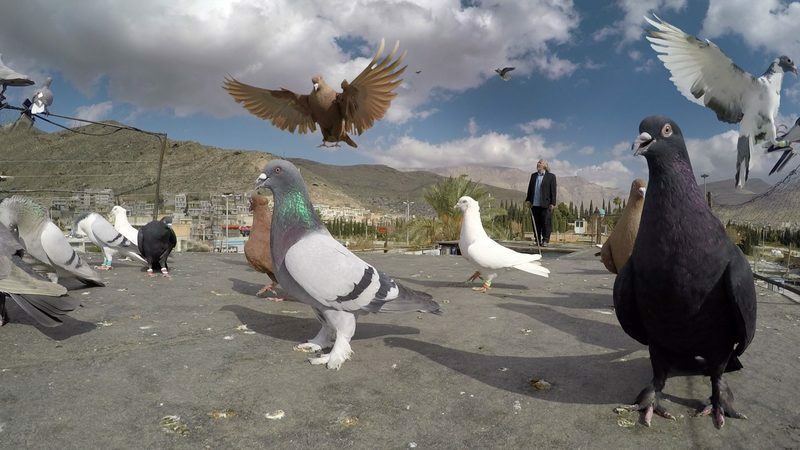 "Ali Aqa" began as a documentary about pigeons and evolved into a film focusing on the title subject. How did the demands of the project change? The subject of the film was Ali Aqa from the beginning but obviously pigeons were big part of his life, so I had to follow both lines of narrative at the same time. I couldn’t skip any of them as then there would be something missing. There’s a moment in "Ali Aqa" when Ali gets physically hostile with you. Did you ever consider abandoning the project, or stopping filmmaking then, and editing the footage that you had? There were a lot of times that I became frustrated and hopeless about finishing the project, but I knew I should be patient so that I can make the film in the best shape. There were more of these incidents related to this scene which I cut. I always get very intimate with my characters and Ali Aqa was more a friend than a subject. We tried to make a balance in the film so the production goes smoother, although there were very tough days. "None of Your Business" departs from "I Am Negahdar Jamali… ," "Dingomaro" and "Ali Aqa" in that it’s about a man who is now dead. It’s much less of a straightforward documentary than those films are. Were there other reasons why you thought Ebrahim Monsefi’s story called for a departure in your style and approach? We were concerned because my character was always a living character in my earlier films. I tried to experiment with a new model in filmmaking, although it was scary and anxiety-provoking. I love the magic realism of Latin America and especially Gabriel Garcia Marquez: that his stories are both real and magical at the same time. I tried to use the same style, because Monsefi's life is like a story out of magic realism. Here we have true stories that are told throughout dream and magic by a dead man. In the original script, the magic realism based on myths of south of Iran were more evident. But the producer suggested that we do more documentary scenes and stay with the documentary tone. The part that is related to dreams is very evident in the film and I am so happy about the style I chose. Do you see your films fitting into a particular tradition in Iranian cinema, or being outside it? I make my films based on my intuitions. My films are very personal, and based on my own life. More than cinema and any filmmaker, I am influenced by the people living around me and that dictates the method I pick to make films. I have always tried not to follow one specific style or confine myself to one specific genre but I loved the films that are trying to find a new language for the cinema and experiment more. I have always tried to make films that can make a connection to all of the world rather than only the people in my own land. Short Films in Focus: "The Voyagers"